The aim of the present study was to determine whether regular exercise training (ET) is effective at promoting the mobilization of CPCs and improving their functional activity in patients with recently acquired myocardial infarction(STEMI). Regular physical training has been shown to improve myocardial perfusion and cardiovascular function. This mayberelatedin part to a mobilization of bonemarrow-derived circulating progenitor cells (CPCs) as well as an enhanced vascularisation. 37 patients with STEMI were randomly assigned to an ET group or a non-ET group(controls). Two weeks after STEMI, three weeks after regular ET and three months after ET, BNP levels, exercise echocardiography and exercise spiroergometry were evaluated. The number of CD34+/CD45+ and CD133+/CD45+CPCs was measured by flow cytometry analysis. The migration capacity of the CPCs was determined with a boyden chamber and the clonogenic capacity by CFU-assay. In the ET-group the number and migration capacity of CPCs increased significantly after regular exercise training. The BNP level decreased significantly from 121 ± 94 to 75 ± 47 pg/ml (p < 0.001) after the ET period, the left ventricular rejection fraction raised in parallel at peak exercise, and the cardiorespiratory condition improved as demonstrated by an increase of VO2max (from 1641 ± 522 to 1842 ± 724 ml/min, p < 0.02). These three effects persist till three months after the ET period. Regular physical activity appears to predispose the mobilization and enhanced functional activity of CPCs, a phenomenon which might lead to an improved cardiac function in patients with recently acquired acute myocardial infarction. Regular physical training reduces the incidence of cardiovascular events such as coronary heart disease, reinfarction and cardiovascular mortality [1–4]. In addition to a reduction of cardiovascular risk factors such as hypertension, diabetes mellitus and obesity, there is also an increased regression of coronary stenosis. Clinical studies have shown that physical training improves myocardial perfusion and cardiovascular function in coronary artery disease [5, 6]. This might be related to a correction of endothelial dysfunction as well as a promotion of antiinflammatory mechanisms . The enhanced expression of eNOS and VEGF (vascular endothelial growth factor) might improve the mobilization of bone marrow-derived circulating progenitor cells (CPCs) into peripheral blood and enhance the process of vasculogenesis [8–10]. Tissue ischemia was found to mobilize bone marrow-derived CPCs into the peripheral blood and contribute to neovascularisation in an animal model . Human bone marrow-derived CPCs significantly increase in patients with acute myocardial infarction  and are able to differentiate into cardiac myocytes, endothelial cells and smooth muscle cells . In coronary artery disease, however, the quantity and function of CPCs are reduced, a phenomenon that might depend on various cardiovascular risk factors such as age, gender, smoking, diabetes mellitus and hypertension. Vasa et al. were able to demonstrate a reduced amount of blood-derived CPCs in the peripheral blood of patients with coronary artery disease in a manner that depended on the number of cardiovascular risk factors . Despite the reduced quantity and restricted functionality of CPCs, Hambrecht and coworkers found that regular exercise training in patients with chronic coronary artery disease can improve cardiac function. An enhanced mobilization of progenitor cells has also been revealed following repeated exercise induced myocardial ischemia, as well as an enhanced expression of angiogenetic cytokines such as VEGF. This increases the mobilisation of progenitor cells from the bone marrow into the peripheral blood and probably leads on the one hand to an intensified repair of vascular lesions in the coronary vasculature and on the other hand to a neovascularisation within the heart muscle . The aim of our prospective study was to investigate the effect of regular exercise training over three weeks (rehabilitation program) on physical capacity, cardiac performance and the mobilisation and function of CPCs in patients with an acute myocardial infarction (STEMI). For this purpose we determined the quantity and function of CPCs in peripheral blood isolated from STEMI patients at three different time points: (t0) bevor intervention (2 weeks after acute myocardial infarction) (t1) three weeks after intervention start (five weeks after acute myocardial infarction) and (t2) three months after rehabilitation (17 weeks after acute myocardial infarction). Patients with a documented ST-elevation myocardial infarction (STEMI), onset of pain up to 12 h, a left ventricular ejection fraction below < 60% and under the age of 75 years were enrolled in this prospective study between February 2005 and August 2006. Exclusion criteria included STEMI, significant valvular heart disease, cardiogenic shock, renal failure, anemia, orthopedics or other conditions that prohibited participation in the exercise training. None of the patients had a history of myocardial infarction. All patients were treated immediately during the acute phase of the infarction with aspirin, clopidogrel and tirofiban. Subsequently coronary angiography was performed and the occluded infarct-related coronary artery was recanalized. 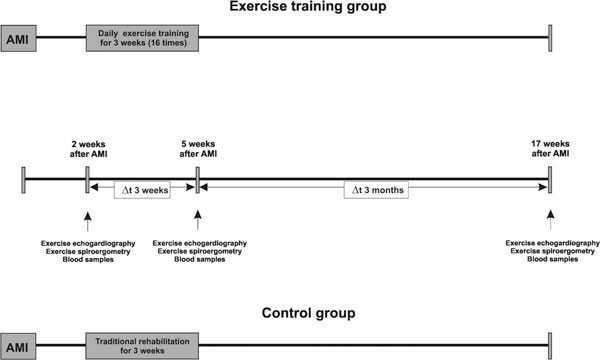 One week after myocardial infarction all patients were randomly assigned to the exercise or non-exercise training group (Figure 1). For therapeutic reasons more patients were randomized to the exercise training group (rehabilitation) and so we chose a 2:1 randomization. At discharge all patients received aspirin, clopidogrel, angiotensin- converting enzyme inhibitors or angiotensin- 1 receptor antagonists, beta-blockers and statins. Follow-up visits were performed at 2 weeks (t0), five weeks (t1) and 17 weeks (t2) and included clinical status, laboratory examinations, ECG, exercise echocardiography, spiroergometry, adverse events and medications. The protocol for this study was approved by the local Ethics Committee of the Heinrich- Heine University in Düsseldorf. The primary end points were changes of global cardiac function using exercise echocardiography from t0 (2 weeks after acute PCI) to t1 and t2 (five and 17 weeks) of follow-up. Global function was determined by left ventricular ejection fraction (EF). Secondary end points comprised changes of oxygen consumption per unit time (VO2) using spiroergometry from t0 (2 weeks after acute AMI) to five and 17 weeks of follow-up. Changes of mobilized stem cells (CD34/CD45+, CD133/CD45+), changes of migration capacity of the mononuclear cells and changes of their clonogenic potential (CFU-assays) were analyzed. A maximal exercise training (ET) test was performed on a calibrated, electronically braked bicycle ergometer in an upright position. It was performed once daily, on five days a week, and for three weeks in total (15 times maximal exercise training, Figure 2). Flow chart of the prospective controlled clinical study. AMI, acute myocardial infarction. According to Gysan et al. 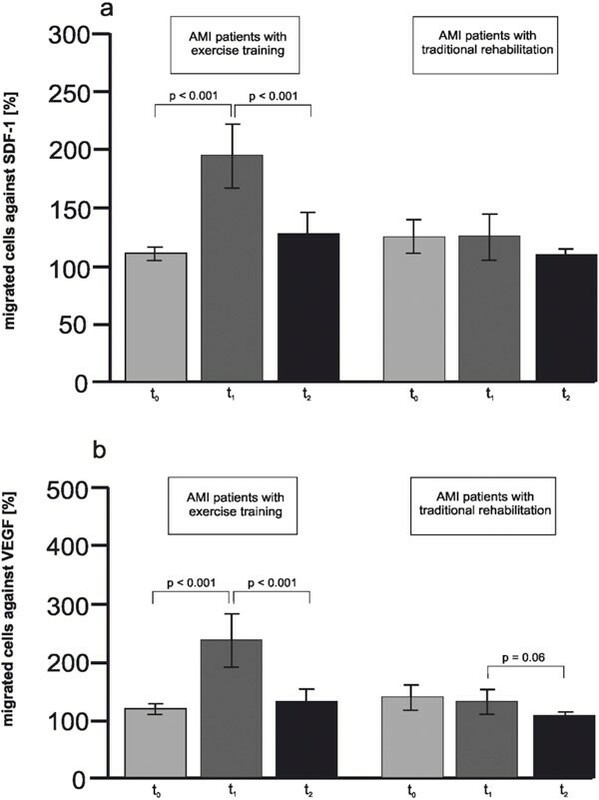 and Schönstedt et al., we chose an ambulatory shortterm endurance training, demonstrating good compliance by the patients and a beneficial outcome [16, 17]. ECG tracing and blood pressure readings were obtained every two minutes. Workload was increased progressively every 2 minutes at steps of 25 W, beginning at 25 W. Myocardial ischemia was confirmed by the presence of typical angina pectoris or a significant exercise-induced ST-segment depression (> 0.1 mV descending or horizontal). Exercise was terminated when patients experienced progressive chest pain, physical exhaustion, or when a 3-mm horizontal ST-segment depression was reached. Echocardiographic images were obtained in the parasternal long- and short axis, and apical 2- and 4-chamber views using commercially available equipment with a 2.5-MHz transducer rate of 30 frames/s. These images were recorded in quadscreen cine loop format before and within 90 seconds after treadmill exercise testing. Enddiastolic and endsystolic diameter of the left ventricle at rest and after exercise was visually interpreted by the consensus of at least two experienced physician echocardiographers unaware of the results of the left ventricular angiogram and the coronary angiography. The digital quadscreen cine loop format was reviewed for analysis of left ventricular function which was assessed by calculation of the enddiastolic and endsystolic volumes (Simpson formula). After resting for 5 minutes, the patients had their arterial blood pressure measured at the right brachial artery using a sphygmomanometer. A 12-lead electrocardiogram was recorded, and resting heart rate (HR) was calculated from the R-R interval. Each subject underwent maximal exercise testing on a computer-driven bicycle ergometer using a ramp protocol starting at 50 W, with gradual increases of 25 W every 2 minutes. During the test, patients worn a tight fitting face mask connected to an Oxycon Pro spirometer. Oxygen consumption per unit time (VO2), carbon dioxide production (VCO2), and minute ventilation were measured on a breath-by-breath basis. Subjects were exercised to their self-determined maximal capacity or until the physician stopped the test because of symptoms such as chest pain or dizziness, potentially dangerous arrhythmias or ST-segment deviations, or marked systolic hypotension or hypertension. A respiratory exchange ratio (VCO2/VO2) > 1 was taken to indicate maximal effort. Maximum oxygen consumption was defined as the highest VO2 obtained at the end of the test and is expressed in ml/min and ml/min per kg. On the day before the exercise training program starts (t0), one day after the exercise training program ends (t1 = three weeks, 15 times exercise training tests) and three months after the exercise training program (t2) venous blood samples were taken in the morning from fasting patients. FACS analysis, isolations of circulating progenitor cells for migration and colony-forming-unit assay were performed in all samples. From the control patients with no exercise training venous blood samples were also taken at matched time points (Figure 2). In order to determine BNP levels, peripheral blood was taken at the same three time points as descriped above. Whole blood samples were used from all patients and BNP was measured using Triage- Meter Plus (Biosite). ml peripheral venous blood was taken from each patient at the three time points, as described above. Blood was taken using a BD Vacutainer CPTTM system containing a citrate anticoagulant with Ficoll Hypaque density fluid and a polyester gel barrier. Blood samples were centrifugated for 20 min. at 3.000 rpm (rounds per minute) at room temperature. The mononuclear cells (MNCs) were resuspended by inverting the tube and the entire content above the gel was transferred into a separate tube. After adding phosphate buffered saline (PBS) the MNCs were centrifugated for 10 min. with 2.300 rpm. Afterwards ammonium chloride was added for 10 min. to accomplish the lysis of all red blood cells. After two washing steps with PBS mononuclear cells were resuspended in 1 ml EBM2-medium (Cell systems). The cell number was determined in a Neubauer chamber. Two colour flow cytometry assays were performed using an EPICS XL flow cytometer (Beckman Coulter/Immunotech, Roissy CDG, France) and Expo 32 data acquisition software (Beckman Coulter/Immunotech). The instrument was calibrated using beads (Beckman Coulter/Immunotech) according to the manufacturer's instructions. For erythrocyte lysis, peripheral blood samples were diluted in 15 ml bicarbonatebuffered ammonium chloride solution (0.15 M NH4CL, 0.01 M NaHCO3, 1.0 mM EDTA) for 15 minutes at room temperature. The cells were centrifuged and resuspended in 500 μl pH 7.2 phosphate-buffered saline (PBS) (lyse-nowash, technique). In brief, 100 μl of white-blood cell sample were incubated with 10 μl of FITC-conjugated anti- CD45 (BD) and 10 μl of phyocerythrin (PE)-conjugated anti-CD34 (BD) or anti-CD133 (BD) for 20 minutes at 4°C. All experiments included samples incubated with an isotype control PE-labelled IgG1 (Beckman Coulter) as a negative control for nonspecific binding. All samples were run in duplicate. Samples were stored on ice in the dark and analyzed within two hours. The ISHAGE sequential gating strategy  exploits the fact that blast cells can be identified from their dim CD45 expression and low sidescatter (SSC). Figure 3 illustrates an example of our experiments using the gating strategy for CD34 analysis (Figure 3a-f). Representative flow cytometry gating strategy for CD45 + /CD34 + (Figure 3a-f) blood-derived circulating progenitor cells, in patients with acute myocardial infarction. Analysis of cell migration was performed by seeding 1 × 106 MNCs per ml in the top compartment of a boyden chamber (Figure 4). The bottom compartment contained either only EBM-2 medium (supplemented with 0.1% BSA) or 100 ng/ml stromal cell derived factor-1 (SDF-1) or 200 ng/ml VEGF (vascular endothelial growth factor) in EBM2-medium (supplemented with 0.1% BSA). Cells were allowed to migrate for 24 h at 37°C in humidified atmosphere. The migrated cells were stained using a Diff-Quick Staining Kit (Dade Behringer) and then counted by two independent investigators. Representative photos of a migration assay from an AMI patient with exercise training; before exercise training (t 0 ), after exercise training (t 1 ) and 3 months after exercise training (t 2 ). Cells were evaluated 24 h after seeding 3 × 106 MNCs per ml in the upper compartiment of a boyden chamber. The assay showed a significant increase of migrated cells after the exercise training. × 105 MNCs per ml were seeded in Methocult GF H4434 (Stemcell Technologies). Culture dishes were seeded with 1 ml cell suspension and then incubated at 37°C in 5% CO2. Colony-forming-unit erythroid (CFU-E) and CFUgranulocyte/macrophage (CFU-GM) were evaluated 14 days after seeding, using an inverted microscope. The different clusters in the CFU assays were distinguished by their characteristic morphology and illumination by using an inverted microscope. No staining or immunostaining was performed. CFU-eryhtroid clusters showed small clusters and emitted a red to brownish colour, whereas CFU-granulocyte/macrophage clusters presented flat colonies consisting of translucent cells. CFU assays were quantified by counting the clusters by two independent investigators. Variables are presented as means ± standard deviation (SD), depicted in the text and figures. Categorical variables were compared with use of the chisquare test or Fischer's exact test. Statistical comparisons between initial and follow-up data were performed in a nonparametric paired fashion using the Wilcoxon signed-rank test. The nonparametric Mann- Whitney U test was used for intergroup comparisons. Statistical significance was assumed if p was < 0.05. All probability values are 2-tailed. Statistical analysis was performed using SPSS (version 12.0). The baseline characteristics were comparable in both groups (Table 1). All patients suffered from an occlusion (Thrombolysis in Myocardial Infarction (TIMI) flow grade 0/1 of 1 coronary artery resulting in extensive myocardial infarctions. Percutaneous coronary intervention was successfully achieved in all patients resulting in TIMI flow grad 2/3. There was no significant difference between the exercise training group and the control group regarding cardiovascular risk factors, use of glycoprotein IIb/IIIa antagonists and current medication. 25 patients were randomly assigned to the exercise training group and 12 patients to the control group with no physical training. Patients in the exercise training group showed a significant improvement in their clinical condition after the exercise training test and three months later, as assessed by the NYHA classification (New York Heart Association). Furthermore, the BNP-level in peripheral blood decreased significantly after the ET-program from 121 ± 94 to 75 ± 47 pg/ml (p < 0.001) and remained reduced three months thereafter at 54 ± 42 pg/ml (Table 2). There were no significant changes in the non-exercise control group. In the exercise echocardiography we found no difference in the left ventricular ejection fraction (EF) at rest in either group over the investigated time, but at peak exercise the left ventricular ejection fraction increased after the three week-long exercise training program from 57 ± 14 to 60 ± 14%, and compared to the EF at rest (49 ± 12%), the peak EF (60 ± 14%) was significantly increased (p = 0.031). In the spiroergometry, VO2max increased significantly only in the ET-group from 1641 ± 522 to 1842 ± 724, p = 0.017 (baseline to after exercise training) and remained stable for the three months thereafter. The NYHA classification showed a significant improvement at five weeks and 17 weeks of follow-up in the exercise training compared to the controls. BNP demonstrated a relevant decrease at 17 weeks of follow- up when both groups were compared. Further, oxygen consumption per unit time per kg (VO2/kg) was slightly increased in the exercise training group compared to the controls. FACS-analysis showed that a symptomlimited (ischemic) exercise training led to a significant and time-dependent increase from t0 (2 weeks after acute AMI) to five weeks of follow-up in the CD45+/CD34+ CPC-fraction from 257 ± 102 to 302 ± 128 cells per 1 million MNCs (p = 0.022) and in the CD45+/CD133+ CPC-fraction from 64 ± 26 to 88 ± 46 cells per 1 million MNCs (p = 0.023). 17 weeks of follow-up, the number of CD45+/CD34+ CPCs decreased to 269 ± 117 cells per 1 million MNCs and the number of CD45+/CD133+ CPCs decreased to 68 ± 32 cells per 1 million MNCs, reaching nearly the level of onset measurement. In the nonexercise training group the number of CPCs remained stable from t0 (two weeks after acute AMI) to five weeks and 17 weeks of follow-up. The number of CD45+/CD34+ cells counted 275 ± 68 cells per 1 million MNCs at t0, 254 ± 66 cells per 1 million MNCs five weeks of follow- up and 268 ± 69 cells per 1 million MNCs 17 weeks of follow-up (Figure 5a and Table 3). The number of CD45+/CD133+ cells was 73 ± 22, five weeks of follow-up 58 ± 19 and 17 weeks of follow-up 72 ± 23 cells per 1 million MNCs. In the exercise training group, the CD45+/CD133+ CPCs was slightly increased at five weeks of follow-up (after the physical training) compared to the controls (Figure 5b and Table 3). 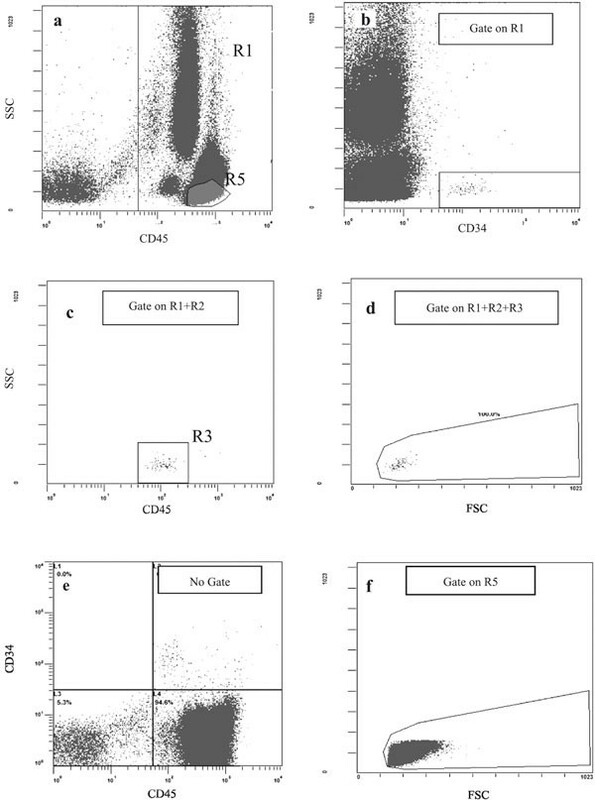 Quantitative evaluation of CD45 + /CD34 + cells (Figure 5a) and CD45 + /CD133 + cells (Figure 5b) by flow cytometry analysis. Patients with exercise training shows a temporarily increase of the CPCs between t0 and t1. In the control group (patients with traditional rehabilitation) were no differences observed. Values are expressed as total numbers of CD45+/CD34+ cells, respectively CD45+/CD133+ cells, related to 1 × 106 MNCs. Values are mean ± SD. t0, before exercise training; t1, after exercise training; t2, 3 months after exercise training. In order to assess the influence of regular exercise training on CPC function, the migration capacity of the CPCs was analyzed. Regular exercise training in patients with STEMI led to a significant enhancement of CPCs migration capacity after the three weeks lasting training program from 113 ± 12 to 199 ± 57% (SDF- 1, in relation to control cells without cytokine, p < 0.001), and from 121 ± 19% to 242 ± 95% (VEGF, in relation to control cells without cytokine, p < 0.001), although this phenomenon had vanished by three months thereafter (Figure 4 and 6a, b). The CPCs migration capacity was significantly increased after the physical training (t1) in the exercise training group compared to the controls. Quantitative evaluation of migration capacity of CPCs in boyden chamber. Relative amount of migrated cells to SDF-1 (a) and VEGF (b) in comparison to cells without chemokines in blood samples of patients with STEMI and exercise training and patients with STEMI and traditional rehabilitation, blood samples were analyzed at 3 different time points. Values are expressed as % of migrated cells without chemokine. Values are mean ± SD. The improved ability of the CPCs to migrate in the exercise training group was accompanied by a stable number of colonies, as demonstrated by CFU-erythroid and CFU - granulocyte/macrophage. In the non-exercise group after STEMI, the migration capacity revealed no increase over the investigated time, whereas the number of colonies in the clonogenic assays declined continuously after acute myocardial infarction from 23 ± 16 colonies before ET to 7 ± 7 colonies three months later in the CFU-GM assay and significantly from 84 ± 51 colonies before ET to 26 ± 29 colonies three months later in the CFU-E assay (Table 3). In this prospective clinical trail, we assessed the effects of regular exercise training in patients with STEMI on clinical parameters (including BNP-level) and on the quantity and quality of CPCs. In patients with STEMI, regular symptom-limited exercise training over three weeks was able to (i) improve the clinical condition (NYHA-classification), (ii) increase the left ventricular ejection fraction at peak exercise, (iii) improve the cardiovascular capacity (exercise spiroergometry) and (iv) enhance the mobilization of blood-derived circulating progenitor cells from bone marrow into peripheral blood, improve the migratory capacity and stabilize the clonogenic potential of the CPCs. These data imply that regular symptom-limited exercise training suffices to increase the quantity and function of circulating progenitor cells. This finding is consistent with the hypothesis that an ischemic stimulus may trigger the release of CPCs from the bone marrowinto the peripheral blood. The development of new vessels in response to tissue ischemia constitutes a natural reaction intended to maintain adequate perfusion. This process was formerly believed to result from the sprouting of preexisting arteries rather than the formation of entirely new vessels. However, this traditional concept was shattered by the observations that operativehind limb ischemia induces a significant increase in circulating bone marrow-derived EPCs and that heterologous, homologous or autologous transplanted EPCs become incorporated into neovascularisation foci [9, 11, 20, 21]. Such results from animal models have also been confirmed in clinical settings. An increase in EPCs and a possible participation in neovascularisation have both been demonstrated in patients with acute myocardial infarction [12, 22]. Clinical trials studying the intracoronary transplantation of BM stem/progenitor cells as well as BM-derived autologous circulating progenitor cells have also shown that these cells have the potential to improvethe function of the myocardium after acute ischemic injury [23–27]. Nevertheless, many questions remain to be answered. 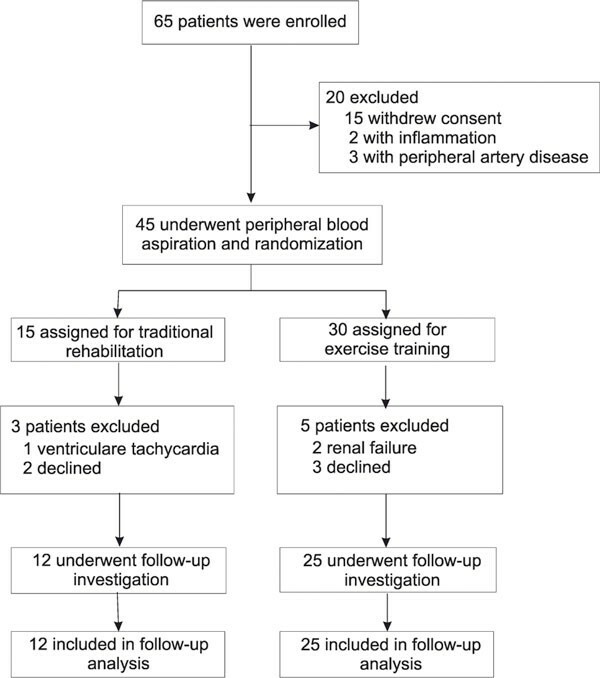 Does a regular exercise training have any effect on the number and function of circulating progenitor cells after myocardial infarction? Circulating progenitor cells as CD45+/CD34+ and CD45+/CD133+ stem cells were investigated, both are primitive bone marrow cells that have the capacity to proliferate, migrate, and differentiate into various mature cell types [28, 29]. These bone marrow-derived circulating progenitor cells express unique surface markers, as CD34 and the early hematopoetic cell marker CD133 (AC133) [30, 31]. Tissue ischemia was found to mobilize endothelial progenitor cells into the peripheral blood and to contribute to neovascularisation in an animal model . In addition, human BM-CPCs have been shown to be significantly increased in patients after acute myocardial infarction (AMI)  and to differentiate into cardiac myocytes, endothelial cells and smooth muscle cells following AMI . Experimental studies suggested that BM-CPCs may contribute to the regeneration of infarcted myocardium [33, 34] and improve neovascularization of ischaemic myocardium [35–38]. However, the function of early haematopoietic stem cell marker CD133 is still unknown. Using CD133 expression to define a very early subset of progenitor cells, Peichev et al. isolated a CD133+ subpopulation of cells, which were able to differentiate into mature endothelial cells. This present study is the first report showing that regular symptom-limited exercise training is sufficient to trigger a time-dependent increase in circulating progenitor cells and their function in patients who had previously suffered an acute myocardial infarction. Regular exercise training leds to a significant increase in circulating progenitor cells (CD34+cells, respectively CD133+cells). This augmentation in CPCs is comparable with the response to other therapeutic stimuli that increase CPCs, such as a four week long statin therapy  or VEGF-gene therapy [10, 40]. The transient increase in circulating progenitor cells after regular symptom-limited (ischemic and/or subischemic) exercise training reached a maximum after the exercise training, but did not persist up until three months after the regular exercise training. This finding extends our knowledge about the long-term effect of rehabilitation training programs on the changes in circulating progenitor cells. 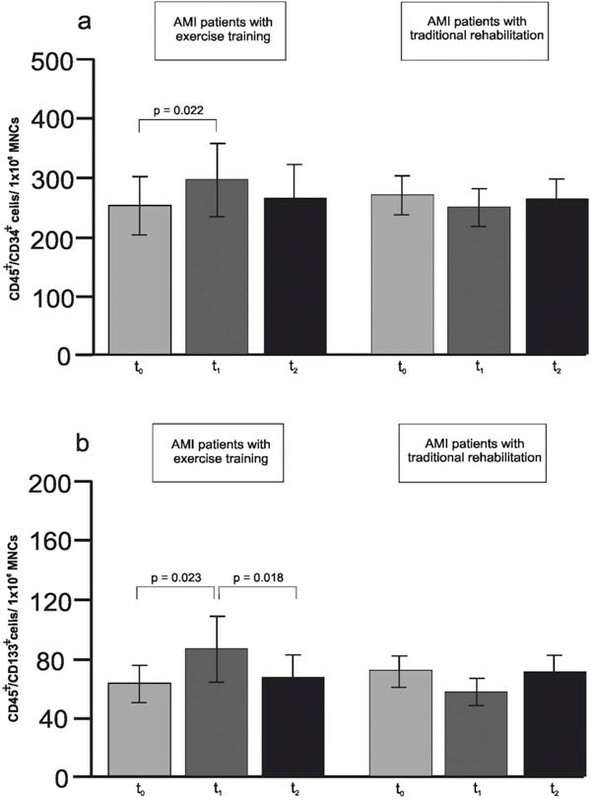 Laufs and colleagues described a significant increase in circulating progenitor cells after a 4 week, non-controlled rehabilitation training program in patients with stable coronary artery disease without exercise-induced ischemia . In that trial it was speculated that asymptomatic tissue ischemia leads to an increase in vasculogenic cytokines, in the same way that symptomatic tissue ischemia does. It is important to note here that an increase in CPCs is associated with significant increases in both CD34+cells and CD133+cells. This observation suggests that the response of the bone marrow to episodes of ischemia is not restricted to a specific cell type release, but is much rather a complex reaction where various progenitor cell populations and leukocyte subtypes become involved. Not only is the quantity of circulation progenitor cells is altered, but their function is also modified by ischemic conditions and therapeutic interventions . Migration of CPCs to ischemic tissue is believed to play a major role in the growth of new blood vessels. Migration is essential for the ability of stem/progenitor cells to invade ischemic tissue. SDF-1 and VEGF are both profoundly upregulated in hypoxic tissue and may therefore represent physiologically relevant chemo at tractants for the recruitment of circulating progenitor cells to ischemia sites [43, 44]. Indeed, intramuscular injection of SDF-1 has recently been shown to increase the number of incorporated endothelial progenitor cells and to improve neovascularisation in vivo . In the present study, a migration assay was performed to investigate the ability of CPCs to migrate into ischemic tissue. The Boyden Chamber simulates the capacity of circulating progenitor cells to migrate to a chemotaxin such as VEGF or SDF-1 in patients with STEMI. This finding is consistent with the notion that both VEGF and SDF-1, which were differentially regulated during ischemic training, are involved primarily in altering the functional characteristics of CPCs. The result of the phenotypic analysis was not in accordance with a larger number of hematopoietic colonies obtained from peripheral blood mononuclear cells of patients with acute myocardial infarction performing regular exercise training, instead the number of the colonies remained stable over the investigated time. In patients with acute myocardial infarction performing no rehabilitation a continuous decrease in the number of hematopoietic colonies was assessed. This is in accordance with Massa et al. , demonstrating a continuous decline at 24 hours and 7 days with respect to admission with acute myocardial infarction. We suggest that immediately after acute myocardial infarction the number of colonies goes up, but then decline continuously. If regular exercise training (rehabilitation) is performed after acute myocardial infarction the decline of the number of colonies is delayed or even prevented. Improvement of clinical and hemodynamic parameters after regular exercise-training ET improves the quality of life in both men and women with moderate, chronic heart failure . In a recent meta analysis by Smart and Marwick looking at patients with stable heart failure, ET was found to be associated with a reduction in cardiorespiratory symptoms and an improved functional capacity . We have shown in our study an improved clinical condition (depicted in NYHA classification) and a decreased BNP-level directly after exercise training and three months there after. Some clinical studies suggest that ET improves cardiac output by consistently increasing exercise capacity in heart failure [49, 50]. Likewise, wealso found a significantly improved exercise capacity in the ET group, probably because of the increased left ventricular ejection fraction at peak exercise and the enhanced maximum oxygen uptake (VO2 max) after a regular three week-long ET. ET in chronic heart failure reduces catecholamines and vascular peripheral resistance while modulating heart rate variability and the baroreflex gain . In a multicentre, randomised controlled clinical study (ELVD) in patients with a first Qwave myocardial infarction , regional wall motion abnormalities and endsystolic volume both decreased 6 months after the ET. In that study it was suggested that an enhanced contractile performance predominantly contributed to the improved left ventricular function in their patients who showed an ejection fraction of below 40%. Our findings show a significant increase in left ventricular ejection fraction at peak exercise in the bicycle echocardiography after ET, similar to the data of Giannuzzi et al., but we did not find an increase in the left ventricular ejection fraction at rest. This difference may have arisen because of the lower left ventricular ejection fraction and the longer exercise program period (6 months) that was evident in the ELVD study. On the basis of the findings of Giannuzzi et al. , it is tempting to speculate that regular exercise training may decrease endsystolic volume and regional wall motion abnormalities by bringing about beneficial changes in the autonomic balance and/or baroreflex gain. This is in line with an attenuation of the vasoconstrictor influence (mainly due to reduced sympathetic activity) and an increase in vagal tone . Regular exercise training improved myocardial per-fusion in stable coronary artery disease . In acute myocardial infarction, long-term exercise training improved left ventricular ejection fraction evaluated by radionuclide ventriculography . Furthermore, early post-infarction cardiac rehabilitation improved the cardiorespiratory fitness, with direct measurement of maximal oxygen uptake (VO2max) . In the present study, we demonstrate an increased exercise capacity, an improved cardiac function and a better cardiorespiratory condition in patients with acute myocardial infarction performing regular exercise training. In an animal model physical training increases endothelial progenitor cells, inhibits neointimal formation and enhances angiogenesis . One mechanism of repair by which physical training may improve in human cardiac function after myocardial infarction, is considered to be the mobilization of bone marrow-derived progenitor cells homing into the damaged tissue area, where they induced neovascularisation [56, 57]. Homing of the progenitor cells can be improved by the chemokine stromal cell-derived factor 1 (SDF-1), which is intrinsically produced by the myocardium after myocardial infarction. As recently shown, the intramyocardial delivery of SDF-1 increases the homing of c-kit+ stem cells . The beneficial effect of regular exercise training on myocardial perfusion has not been well established in humans. However, increased myocardial perfusion was demonstrated after symptom-limited exercise training after acute myocardial infarction [59, 60]. Mechanisms that promote enhanced myocardial perfusion include significant release of bone marrow-derived progenitor cells into circulation, as observed in our study. In addition, paracrine angiogenic factors, such as vascular endothelial growth factor are released after physical training and may increase neovascularisation in ischemic tissue [41, 61]. Enhanced neovascularisation may serve as one important mechanism facilitating reduction of infarct size after myocardial infarction. In this first prospective clinical study, we were able to confirm the efficacy of a regular three week-long (15 times) symptom-limited (ischemia) exercise training in increasing both the cardiac function and number of CPCs amongst patients with STEMI. The following major conclusions can be drawn from our findings: (i) local tissue ischemia induced by symptom-limited exercise training enhance the mobilization of regenerative progenitor cells from bone marrowinto peripheral blood, (ii) ischemia may be involved in the regulation of the migration capacity of CPCs and (iii) enhanced mobilization and increase migration capacity of CPCs are associated with improved cardiac function and cardiorespiratory condition. Thus, early short term exercise training has beneficial effects for the rehabilitation of patients with STEMI. We thank Andrea Tüffers and Evelyn Chetolin for their excellent technical assistance.